"It's Not Easy Being Green." That is the title of a song sung by Kermit the Frog of Muppets fame. The word "green" has been hijacked by environmentalists to be applied to every process that relates to their idea of a perfect world where mankind has an utterly benign presence. Unfortunately, as with many good causes, extremists taint the process to the extent that many people who would otherwise get onboard are repulsed to where they do not even want to be associated with the concept. Anyone who has been around RF Cafe for a while or otherwise knows me is aware that I have long been an advocate of responsible Earth resource management without requiring that insufferable actions be taken to coerce compliance with radicals' demands. In an ideal world, everyone would exercise a reasonable level of personal responsibility by not wantonly wasting or exploiting natural resources, especially to the extent that their actions demonstrably cause harm to others. Contrary to Kermit's claim, however, it really is not so hard to be at least some shade of green. From a purely technical perspective, you would expect anyone who is not a Flat Earth Society member would eagerly adopt methods and technologies that are less wasteful of natural resources and respectful of the physical appearance of the world around him†. Given the choice between a more polluting option and a less polluting option for, say, interior wall paint, why would you choose the former over the latter? Many times the more environmentally preferable option is much more expensive. If that is the case and you simply cannot afford the price difference, then I do not hold the decision to use the more polluting option against anyone. Some people do mind. Those are the ones I have a problem abiding because those same unforgiving people are usually hypocrites themselves. You know the kind. Along with reading many engineering and science magazines, I also peruse the home improvement magazines like Workbench. They are filled each month with product reviews of some très cool new building materials, tools, machines, production processes, and other worthwhile items that push the environmental responsibility frontier a little farther forward. For instance, a couple months ago, there was an article that did a great job of explaining the difference between high and low VOC (volatile organic compounds) paints. Henceforth, I will seek out low VOC finishes for my projects. Abandoning the older heavy metals battery chemistries (NiMH, NiCad) in favor of the more eco-friendly Lithium models is an area where the benefits of newer technology (Li-Ion and Li-Polymer) outperforms the old, with only a modest increase in cost. I have learned a lot of similarly easy to adopt and effective behaviors. Still, as mentioned, not everybody can afford to own the highest efficiency equipment and practice a totally environmentally optimal lifestyle. That is a key contention point in contemporary arguments over whether coercive mandates by all-powerful government bodies are fair. Extremists exist on both sides of the argument. Some say we should all ride bicycles, eat plant roots, and wear human-powered-loom-woven wool clothes, while their antipodes assert that if you can afford to pay for something, you are entitled to as much of it as you want, and can do with it whatever you please. The former are often hypocrites; the later, while maybe contemptible, are at least honest. My personal motivation for conservation is two-fold. First, there is an innate feeling of wrongdoing and remorse when I do something that is knowingly wasteful, like running a lawnmower engine that is spewing blue smoke into the air, emptying a can of old paint back in the woods where nobody will see it, or throwing a soda can into the garbage when I have a recycle bin for it. Therefore, I try not to do such things. The second motivation is financial. With exceptions, well-functioning machines and systems run at higher efficiencies, and are therefore cheaper to operate. A personal cost-benefit tradeoff calculation is needed when deciding on the acquisition of a higher efficiency system. All this leads into my real topic - the whole-house rehabilitation Melanie and I recently completed (well, almost completed) on our home in Erie, Pennsylvania. Both of our children, Philip and Sally, graduated from college and moved out on their own a couple years ago, so we have the proverbial "empty nest" situation now. We decided that we would buy a small house and make it as efficient as possible using reasonable measures. 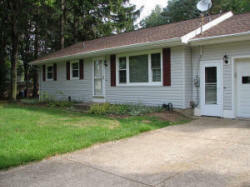 In May of last year (2008), we purchased a 1950s era, single-story, 940 ft2 (87 m2) house a mile from Lake Erie. It has three smallish bedrooms, one bathroom, a single car garage, an unfinished basement, and sits on about 0.7 acres in a working class neighborhood. No major upgrades had been done to it - original windows, doors and siding, original cabinets and flooring, original electrical fixtures and plumbing. There was no insulation in the walls, and flattened 2" thick fiberglass insulation in the attic. Oh, the roof had recently been replaced by the previous owner because a tree fell on it a year ago, and the overhead garage door was new. The place was in solid fundamental shape, but just old. Almost no part of the house has gone unimproved. Four major energy-saving changes were implemented. 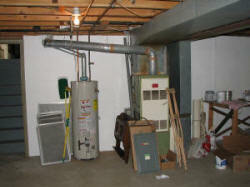 First, the 60-year-old gas furnace was replaced with a top-of-the-line, 93% efficiency Trane gas model. Second, all of the original single-pane, wood framed windows were replaced with low-emissivity (low-e) thermopane double hung windows. Third, the empty wall cavities were filled with an injected, high-tech material called Air Krete (~R-14 in a 2x4 stud wall). Fourth, fiberglass insulation totaling R-49 was installed in the attic. Because both gas and electricity prices have risen since last year, a 1:1 comparison is difficult. The utilities will not provide detailed information, but we were able to get actual CCF (hundreds of cubic feet) for a couple months in early 2008. Thus far, usage has been around half of last year's values. We replaced the old electric oven/stove top with a gas model, which means our gas usage is even lower comparatively. The programmable thermostat is set for 69°F during the day, and 62°F at night for heating, and at 74°F for air conditioning. New values versus old values of kWh consumption are less mainly because of the absence of the electric oven. However, there is a dehumidifier in the basement now which is set for 70% RH; it does not run at all during the heating season. The exhaust motor for the radon evacuation system is now on a timer where it runs at intervals for about 60% of the day (I conducted two radon tests to verify sufficiency). All of the light fixtures have been replaced and the bulbs are all the CFL type (compact fluorescent light). I used to be bothered by CFL light quality, but even in the last year they have gotten noticeably better. After being on for about 5 minutes, the light is very acceptable. Still, having to have the HazMat suit in the closet in case one ever breaks is a bit troubling. BTW, as I write this, there is a foot of snow on the ground (and on the roof for that matter). Erie is on track for its snowiest winter on record, with 131.8 inches thus far. We moved into the house on May 28, 2008, and the next week Erie had one of its hottest weeks in history (the entire rest of the summer was very nice). The house had no air conditioning, so it was not a hard decision to include an AC compressor along with the new gas-fired furnace. A top-of-the-line HVAC system was installed that has a rated efficiency of 93%. The old system might have topped out at 30-40% according to the technicians that installed the new one. A very visible indication of the difference is the exhaust pipes. The old system used a metal flue whereas the new system's exhaust temperature is so low that a PVC pipe is sufficient. That is pretty amazing. This is the system I recently wrote about that caused severe EMI on the AM radio. Also, a whole-house humidifier was installed, which not only allows a lower temperature to feel warmer, but not once this winter have I gotten a shock when touching a doorknob (triboelectric charging). Installed price: $5,700. The hot water heater is of 2004 vintage. Newer models are not a whole lot more efficient, so we elected to keep the existing model and wrap it in an insulating blanket, and install pipe insulation on the 20 feet of hot and cold water supply nearest the unit. Price: $30. Next came window and siding replacement. The original windows were single pane models with leaky wooden frames. Triple track aluminum storm windows had been installed, but they were ill-fitting and just plain ugly. The new windows are about as efficient as can be found, and incorporate the low-e glass with argon gas between the panes. Even in high winds, there is absolutely no air infiltration around the perimeters. Weather stripping on these windows is very high quality. As a side note, the windows in the newly built house we owned in north Carolina were crapola by comparison. Installed price: $3,000. Siding was the original aluminum (aluminium for those of you across the pond), as was the soffit material. House wrapping cloth had not been invented when this place was built in the late 1950s, and there was no Styrofoam sheeting behind the siding. When combined with no insulation in the walls, the overall inside-to-outside R-value might have been a whopping 2 or 3 in good spots. 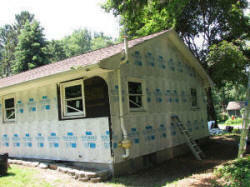 As part of the new vinyl siding installation, large panels of Styrofoam were applied under the siding so that they provided not just a couples Rs of insulation benefit, but also created an air infiltration barrier. From a recycling perspective, the only scrap was the aluminum, which the installers graciously offered to cart off for me (they probably made a couple hundred dollars from selling it to a reclamation center). If I had not traded in my SUV for a fuel-efficient Chevy Cobalt, I could have carted it away myself and saved some money. Installed price: $6,000 (siding, soffit, & wrapping). I replaced both outside doors myself. Originals were hollow panel wood with no insulation inside. Of course they were leaky. The new doors are insulated metal construction with thermopane glass, and good seals. The old aluminum storm doors, like the storm windows, were leaky and all the rubber seals had disintegrated. All three storm doors, which includes those on the garage, are high quality with excellent seals all around the perimeter. Price: $800. One of the coolest aspects of the renovation was having a high-tech blown-in foam insulation installed in the walls. Tearing off the inside of outside walls to insert fiberglass mat insulation was never even an option as far as I was concerned. I briefly considered a do-it-yourself injectable foam system that is applied from the inside by drilling 1/2" holes between the wall studs and squirting it in through a nozzle that mixes the 2-part chemical cocktail as it injects. The new foam formulations do not have the killer urea formaldehyde like the nefarious stuff used back in the 1970s, but the cost would have been around $4,500 to completely fill all the outside walls. 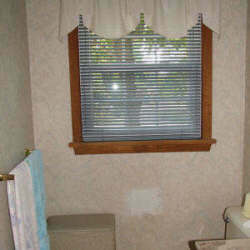 Besides, the expansion properties presented problems with bulging and cracking walls. I also did not fancy the thought of having to patch a hundred holes in the wall. The advertised R-value for that stuff for a 3.5" wall is about R-20, which is extremely good when considering that standard fiberglass is only R-13. An advantage that all of the cavity filling, injectable systems is that they create a solid volume which does not support convection currents. Convection in the wall is responsible for the majority of heat loss since, in the same manner that blowing air over a hot surface cools it more effectively. 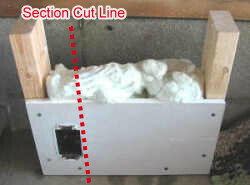 Air convection still occurs with fiberglass batting both because it is not close-celled, and because sloppy installation usually means coverage is not complete. Fortunately, there is a contractor that handles the Air Krete material right here in Erie (Bauer Specialty), so I gave him a call. About three weeks later the crew showed up to get the job done. With our house being so small, the entire process took only about 6 hours. I built a test wall cavity with an electrical box in it to examine how well the system worked. The guy operating the injection nozzle filled it for me, and also did not mind that I made a short video of the filling process in the house wall. †† There is obvious evidence of shrinkage (~4%) where the Air Krete has pulled away from all four sides, even though the specifications claim otherwise. Cavity fill overall looks good, and appears to completely encapsulate the electrical box; which eliminates the need for installing those thin foam gaskets under wall plates. I will be contacting the Air Krete company about shrinkage. Installed price: $2,200 (all four outside walls). Update: AirKrete contacted me and after watching the video I made, determined that the installer, Bauer Specialties, both mixed the brew incorrectly and installed it improperly. Bauer Specialties is supposed to look into it, but has not done so yet. 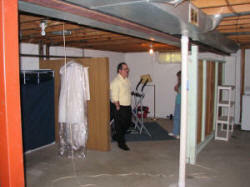 The fourth main energy saving improvement was adding fiberglass insulation in the attic. We laid R-19 paper-faced insulation in-between the 2x6 ceiling joists (front to back of house), and then laid un-faced R-30 insulation perpendicular over the R-19. 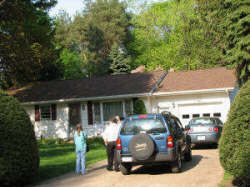 Care was taken to allow "breathing" space at the soffit overhangs. Additionally, sections of R-19 insulation was installed in the basement against the outside walls in-between the floor joists. A thermostatically controlled vent fan was installed in the gable end of the house, and in the garage gable end. I think they are set to turn somewhere around 110°F. Price: $650. 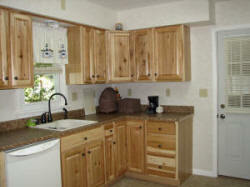 All of the replacement appliances are Energy Star rated (refrigerator, dish washer, range). As usual, we seem to always miss the tax rebates. All of those energy efficiency improvement programs had ended by 2008. However, if I sell the house and make a profit, the reprobates in Government will see to it that they benefit from my labor by charging me capital gains tax. Total for improvements related to energy efficiency increases: ~$15k. Although not necessarily concerning to improvements in energy efficiency, you might be interested in seeing some photos of other aspects of the renovation. Many of you have suffered through similar projects. We figure the total investment in the renovation is about $28-30k, so our house has cost - not including a lot of sweat equity - about $135k. That is pretty good for a home which is pretty close to being as efficient as it can reasonably be. The cost of living in this house is now very low compared to just about anything else in Erie - even newly built homes in planned developments. Not a single wall, ceiling, or piece of trim molding has escaped repair and painting. The only wallpaper used was for the top half of the kitchen. Every light fixture, wall switch, and receptacle (along with their cover plates) has been replaced, both inside and outside. Several new overhead light fixtures were installed where none existed, including new switches. A few receptacles were added as well. The garage and basement originally had only one receptacle each, and sported simple porcelain light fixtures pull chain switches. That has been rectified. Drywall was hung on the garage walls to give it that new house look. 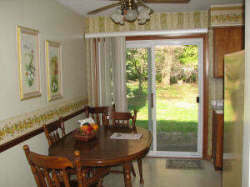 Closet doors were replaced with paneled bifold doors that do not take up as much room when fully opened. Every hinge and doorknob was replaced. 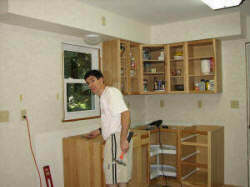 The warped solid pine closet shelves were replaced with the plastic-coated open wire type. Melanie and I did all that work ourselves. Outside, we removed a very large, overgrown hedge row of yews that lined the front of the property. 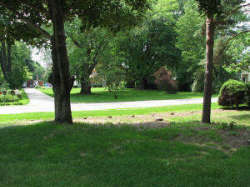 We thinned out and manicured a patch of trees to the north and another one in the back yard. An old well casing got covered over, and about a hundred wheelbarrows full of dirt was relocated to fix an area of ground that drained toward the house. Once the snow melts and the ground thaws in a couple months, we will tackle the flower beds and put in a front pathway from the driveway to the front door. That will be nothing compared to all the other work that has been done. There is a lot more to the story. If you are ever in Erie and want to stop by to say hello, let me know and I will be glad to give you a guided tour. I promise not to show home movies. Not apparent is how overgrown this hedge row is. The tops are about 6 feet high. The trunks and branches were so thick that trimming would be impossible. So, out came the chain saw. Cutting and disposing of about 25 of them is something I do not care to ever do again. Stumps have been cut below the surface and seeded since this photo was taken. You would never know they were there. the neighbors are very happy to have that hedge row gone. The dining room is technically separate, but it is small. Ugly Linoleum was on the floor. The sliding glass patio door is only a couple years old. All the overhead fans were replaced with regular light fixtures since the auto-switchover digital thermostat calls for heat or AC, and the windows and doors are rarely open. Carpet installed with oak trim separating the kitchen from the dining room. 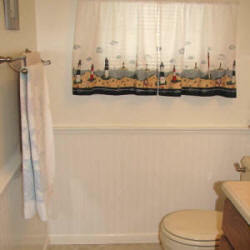 The bathroom had been renovated in the early 1990s. We removed the wallpaper, painted the top 2/3, and installed wainscot with a ledge on the bottom 1/3. A new vanity top and nice faucet set were used with the rehabilitated vanity base and medicine cabinet. All new bath/shower fixtures were installed. The warped pine linen closet shelves were replaced with the plastic covered wire metal type, and the closet door replaced with a bi-fold that did not take up as much room to open. New heavy floor tile was installed. It is impossible to tell from the photos, but the oak flooring was in awful condition. Rather than going to the mess and trouble of refinishing it, we installed carpeting throughout the house (everywhere except kitchen and bathroom). It involved removing all the baseboard trim to raise it for carpeting to go under. 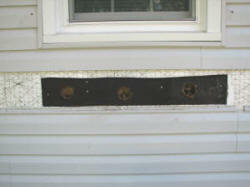 The trim's old nail holes were filled and the trim painted prior to re-installation. Two overhead light fixtures were added. This room had the least done to it (other than replacing the front entrance door and storm door). That is Melanie sitting in her office. All of the dangling extensions cords, telephone extension cables, and coaxial cable were removed and replaced with permanent installations. The ill-planned wall sections and shelves were removed (those sold via CraigsList too). Melanie and our agent are there. The basement has remained 100% free of any traces of water. 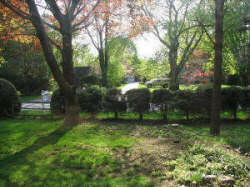 The house and yard were in sound shape and served as a good basis for improvements without having to deal nasty old stuff - I've done enough of that over the years. That is our agent, Gerry Seelinger, with Melanie. 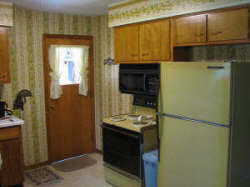 Everything original was replaced, and even the door was shifted to the left to make room for the cabinets. The garage is on the other side of the door. I sold a lot of stuff on CraigsList, including getting $350 for the cabinets. 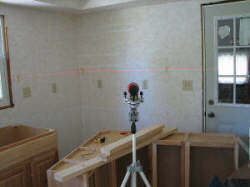 The laser level was a very nice tool to have on hand. 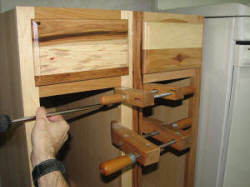 A π-shaped support was built to hold the wall cabinets in place during installation. Mounting holes were pre-drilled and threaded so that Melanie could quickly put in the first couple screws while I struggled to hold the L-section in place. 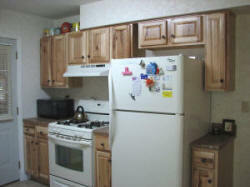 These cabinets are off-the-shelf, hickory wood units from Lowe's. Really high quality versions cost 2x or 3x as much. The refrigerator/freezer is only 18.4 ft3, but that is plenty for a house this size. The range is gas fueled - my first foray into installing gas pipe. It has not blown up yet. Many new receptacles and overhead lights/switches were added throughout the house. A total of four sections of countertop are used, including the homemade L section here. The original kitchen had no dishwasher. The sink is a nice Kohler single-holer with a good grade faucet set. New floor underlayment and heavy tile installed. If you buy a standard cookie cutter house in a development, it is unlikely that the cabinet installers will bother to properly joint the units to each other. Here you can see the cabinet units clamped in near perfect alignment, and I am drilling pilot holes with countersinks for screws. This assures that the cabinet fronts remain in alignment regardless of how the frames might shift over time. The room is small by today's standards, but it is big enough. 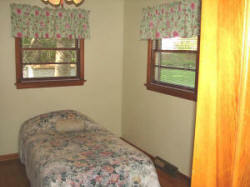 This is the designated hobby room, exercise room, and sewing room. Not shown is the 30" bi-fold door that separates BR#2 and BR#3. 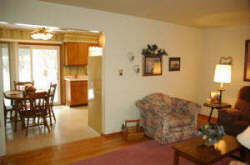 It allows the two rooms to effectively be combined. † The grammatically correct matching of quantities is practiced on RF Cafe, regardless if it is politically insensitive or mildly offensive. E.g., the words "anyone" and "anybody" are each singular indefinite pronoun forms that commonly reference a singular personal pronoun such as "his" or 'her." Common practice has been to use plural personal pronouns like "them" and "their" in place of the proper singular personal pronoun. Saying, "Everyone made up their minds," is equivalent to saying, "The one person made up their minds." See this Boston Globe article.